This guide is going to tell you an easy, fairly early-game custom squad you can use, plus tactics to ensure that you get an easy win every time. How to Unlock All Squads and Pilots (Cheat). Frozen Titans Tips & Tricks. 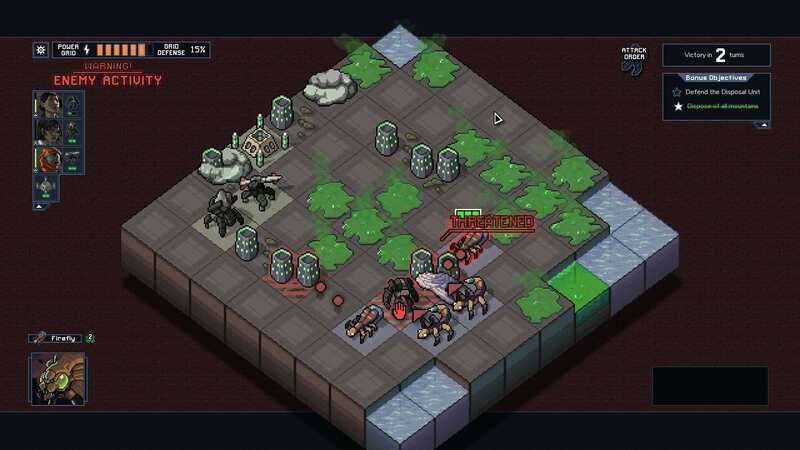 Into The Breach is a pretty good game. But it fuc'king cheats. The game is tricky dicky, and it's damn hard too. Nearly all the mech squads you can unlock are pure s'hit, completely useless combinations of mechs with hardly any chance of winning outside of pure luck. The good thing? Custom squads exist. Using this revolutionary feature, you can out-cheat the game and get consistent, easy wins by slapping good mechs together from otherwise s'hit squads. Check it. Because this is a Custom Squad build, you're going to need a few mech squads to get the best mechs you can possibly get. Camila is incredibly useful for use in the Combat Mech. Her passive ability prevents her from being webbed, webbing being a huge threat to success, forcing you to waste a turn on a Vek you might want to ignore for a turn. If you don't have her, you'll probably be fine. She's just helpful. These are the crazy strong mechs that will bring you to victory. This Custom Squad build is built around pure damage output. Seemingly every squad the game gives you has useless mechs, mechs with 1-damage output, or NO damage output. The game makes you want to think that pushing and bumping smart enough is better than doing big damage. It isn't. This Squad fixes that. Every mech by default has 2 damage. That's enough to take out leapers, scarabs, diggers, hornets, spiders, and every type of psion from the start. This is going to let you clear the field much more efficiently than any other squad. Now, on to how to make these mechs work together. Clear the board. Don't get swarmed. These are the basic tenants to win. Make sure you are killing vek faster than they can get out. You don't want more than 4 vek alive and attacking at once, ever. These mechs are all about damage. You are going to want to focus on killing Vek more than anything with this build. You have plenty of push available, if you can't kill vek in one shot. Of couse, always make sure to defend buildings first. Play smart. With this build, you will never need to take more than 1-2 damage on an island, and that's if you're getting really bad luck. I've gotten many islands damage-free. 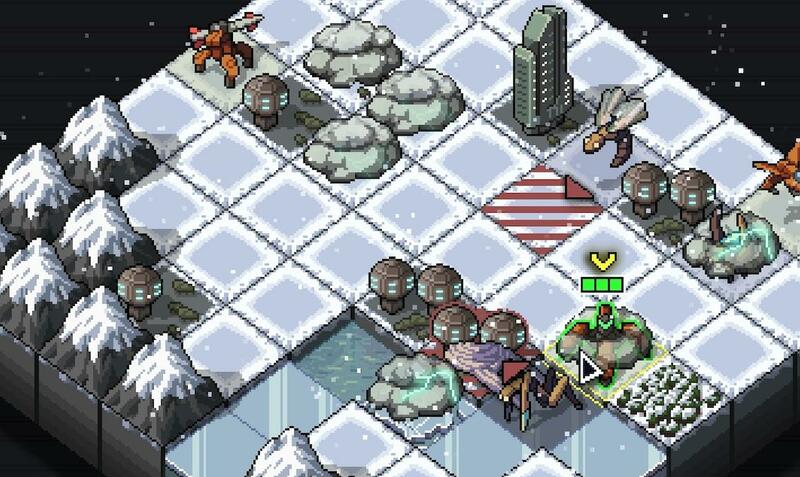 Place the Combat Mech up front, closest to the Vek, with a clear path to get to them. 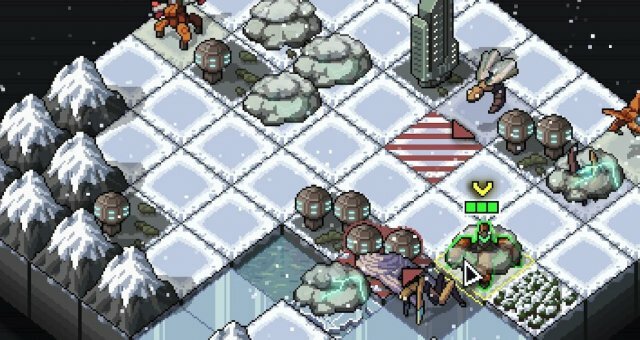 Place your two artillery mechs on the edges, making sure that they have a clear "line", so they can move to hit any tile on the map. Look at the screenshot on the right, and note how the artillery mechs have a free, non-obstructed line of sight on pretty much every tile. This will get you max use out of your artillery mechs, which are both big contributors. Upgrading / Reputation Strategy - Very Important! You're first going to want to upgrade your Combat Mech's health for one reactor. It's in the front line of the fight, and extra health is going to let it meatshield shots, and block vek spawning with way less risk. You probably want to start the run with a pilot that has +1 reactor to get this out of the way immediately. Once you start getting more reactors from beating an island, upgrade one of your artillery mech's damage for two reactors. Upgrade one, and make sure to upgrade the other mech's damage afterwards, to make sure none of them are lacking in damage. The Rocket Mech's damage can be upgraded twice, and you can de-activate it's passive to get free reactor energy. Lastly, you're going to want to get 3 reactors onto your Combat Mech to boost it's damage to 4, making it a powerhouse. Once you get these, you can easily destroy anything, and can probably take on the final boss. Don't worry about extra weapons, the things that matter the MOST are getting reactors/energy. Spend your rep on these. But the most important thing is to look at what boss the island has. If the island has the Spider boss or the goo boss (these two), don't go to that island. These bosses are cheap as hell, and you will more often than not get swarmed, and be forced to take damage. Always remember that you never need to visit all 4 islands. You can complete this with any number of islands, but I find it easiest to not do 4 islands, because by the 4th island, nearly every vek is alpha, and it just makes everything more difficult, for little benefit. Do it with 2-3 islands.